Anytime cough relief, Safe all natural relief for all age's. Most people will see relief in 12-15 minutes. For small kids and babies just crush 2 pellets and dissolve in a small amount of lukewarm water and spoon into mouth. This is a great product buy early and have on hand as this product saves well ,keep out of direct light and at normal temps and it will last years. 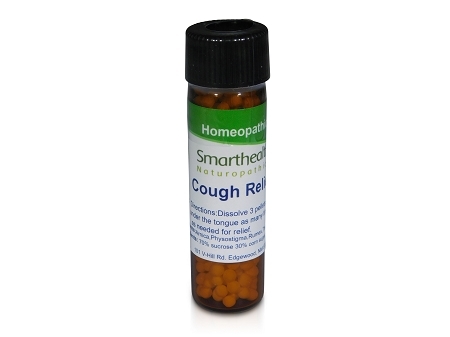 If you'd like a cough relief medicine that's non-chemical and safe for you and your children try this product as with many homeopathic combination remedies they sometimes don't work we don't know why, but you can send it back for a full money back refund..Many people will find this product will work for a dry cough,chronic cough,intermittent cough, day or night time cough. This product was made in a FDA supervised laboratory using state of the art manufacturing methods. These statements have not been evaluated by the FDA. this product is not intended to diagnose, treat, cure, or prevent any disease. Dissolve 3 pellets under the tongue as many times daily as needed for relief,or as your Physician directs you. Active ingredients:Physostigma,Rumex,Thiosinaminum,Arnica. Inactive ingredients:70%sucrose 30% corn sugar in non allergenic pellets.